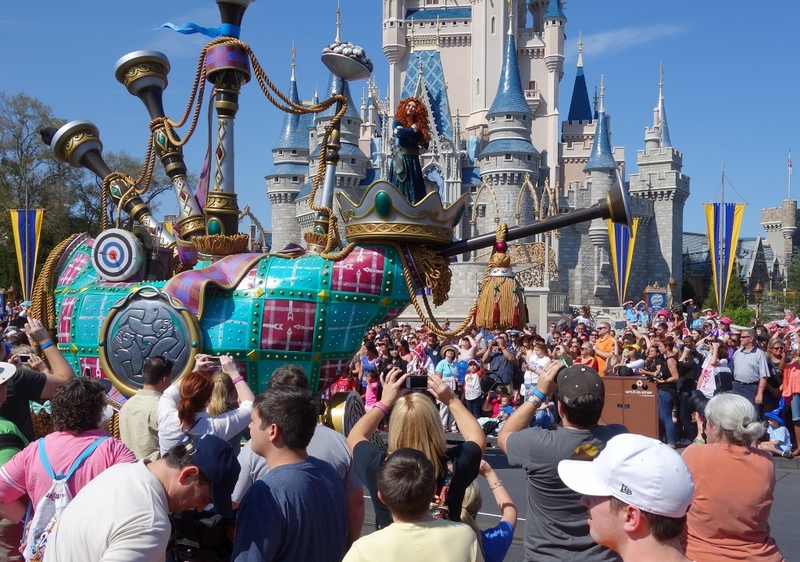 The Magic Kingdom’s afternoon parade, “Disney’s Festival of Fantasy Parade,” debuted March 9, 2014. 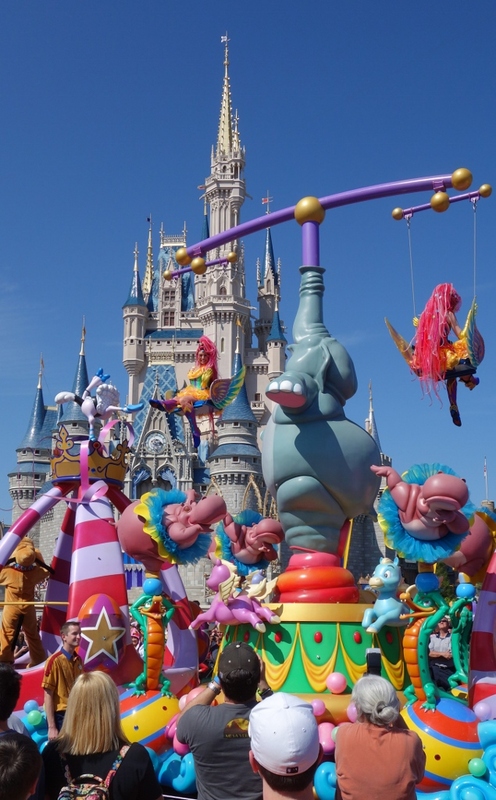 The parade presents “Mickey and his Fantasyland Friends” through a series of new floats, music and dancers. It begins typically every day at 3p, although two afternoon parades are scheduled on the very busiest days of the year. 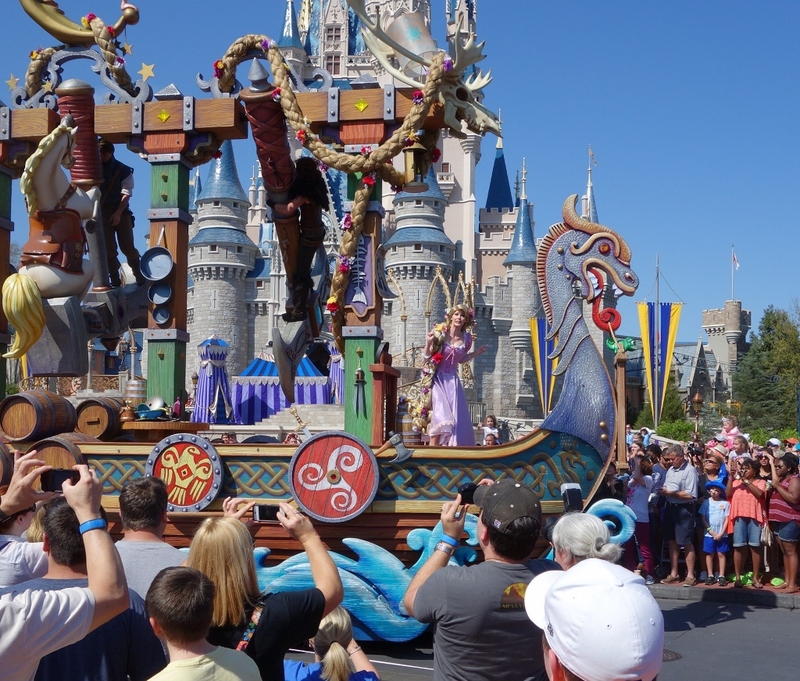 The parade presents a mix of both classic Disney characters and those from its most recent films, and, because of its “Fantasyland” theming, a more coherent set of characters than in some past parades. 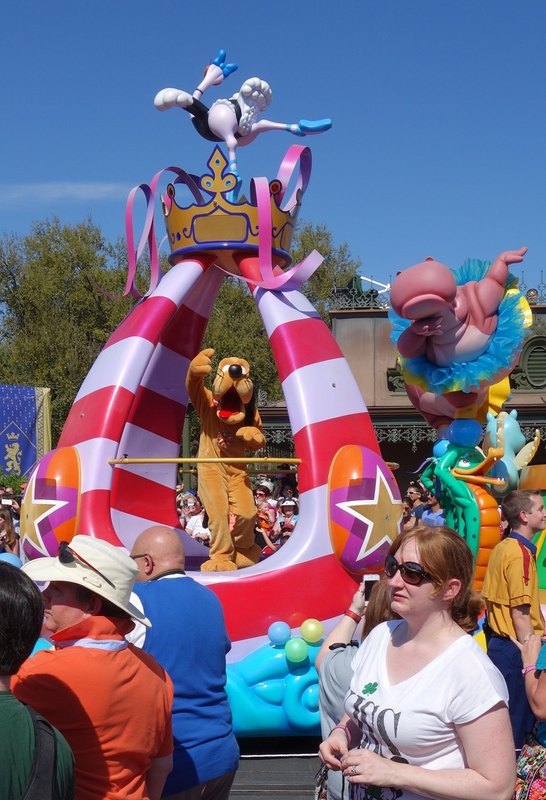 The new floats are really tall, which means littler kids can see most characters even if they are not right at the very front of the parade viewing areas. 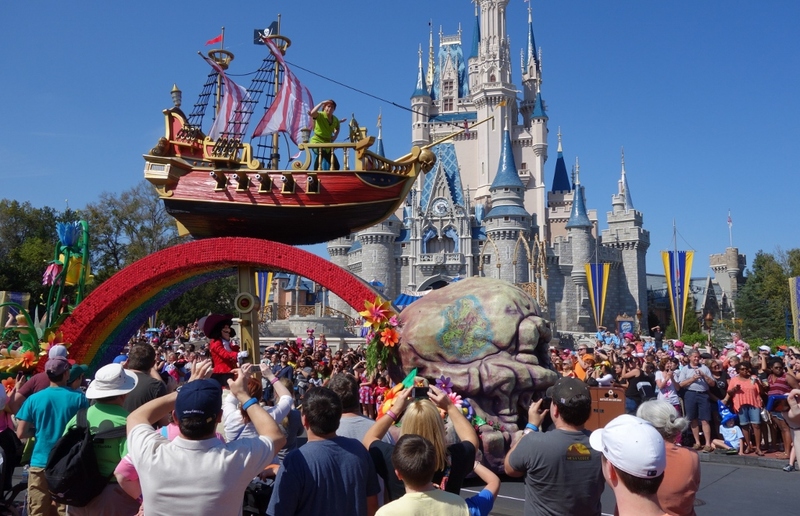 The all-new musical track combines a new parade song with stretches from the classic songs of the films depicted on the floats, and ends with a really big beat. 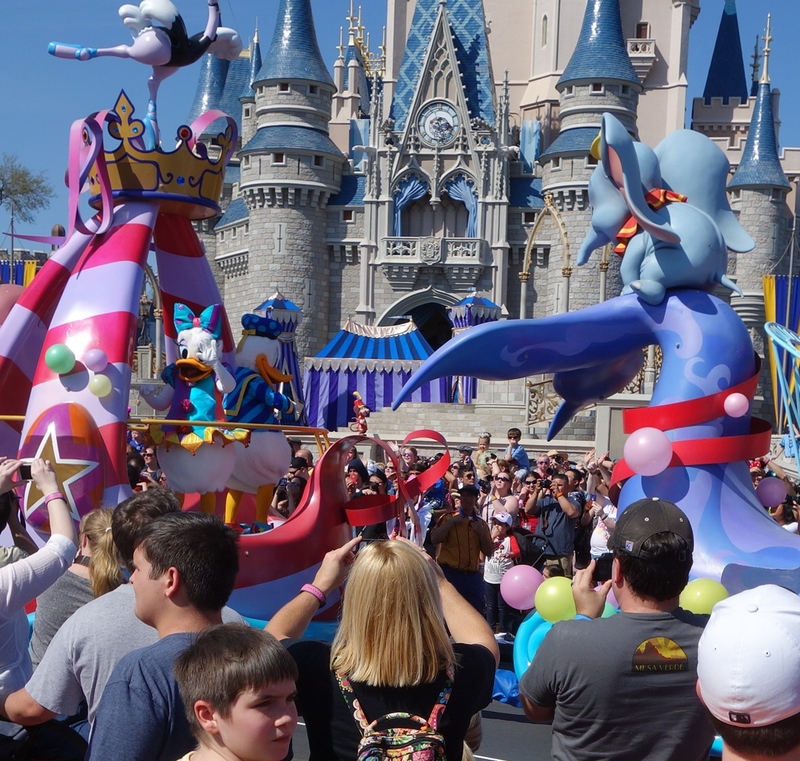 The more visible floats, more current characters, and a bunch of really nice designs make the Festival of Fantasy Parade the best new parade at Disney World in decades. 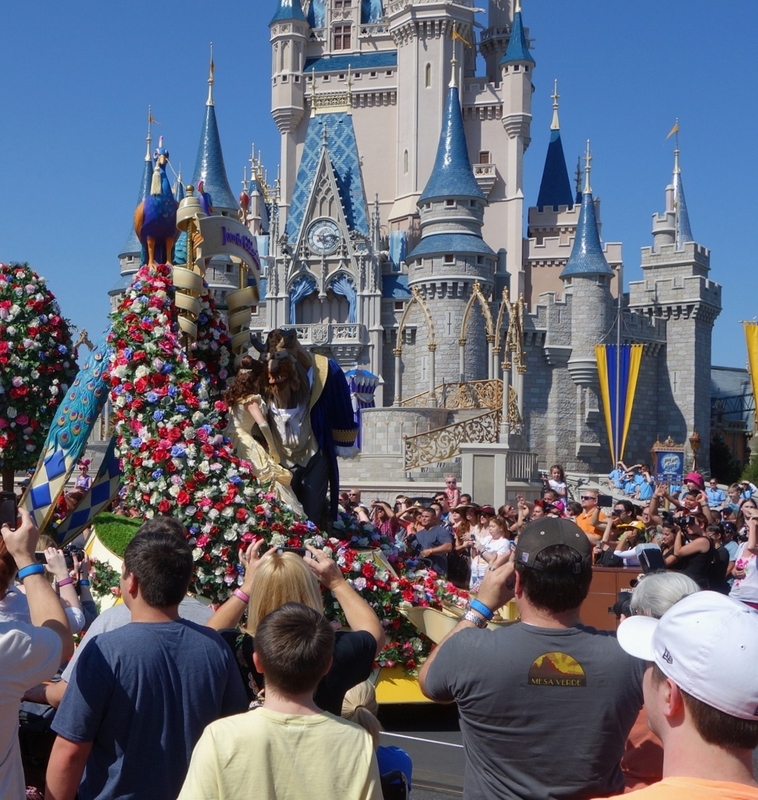 Belle and the Beast lead off the parade, as the first part of a three part-float. 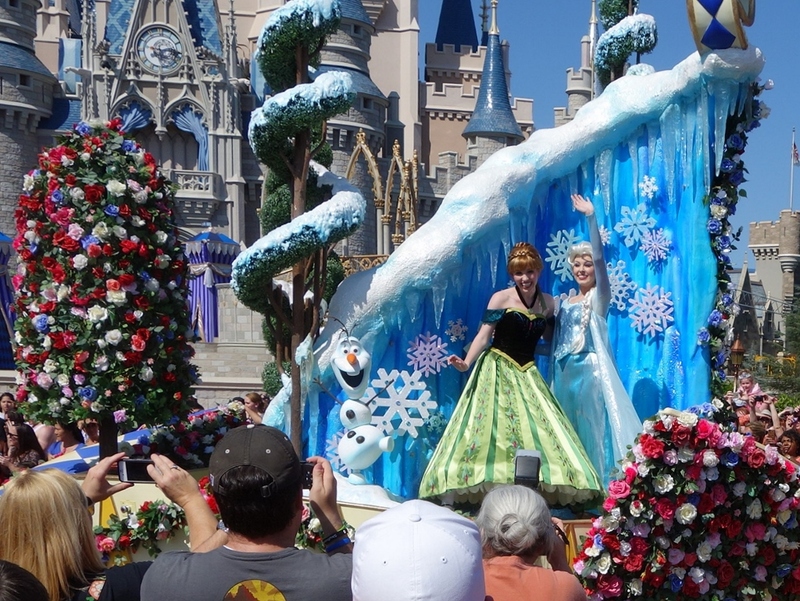 …and these hot yet Frozen princesses on the other. 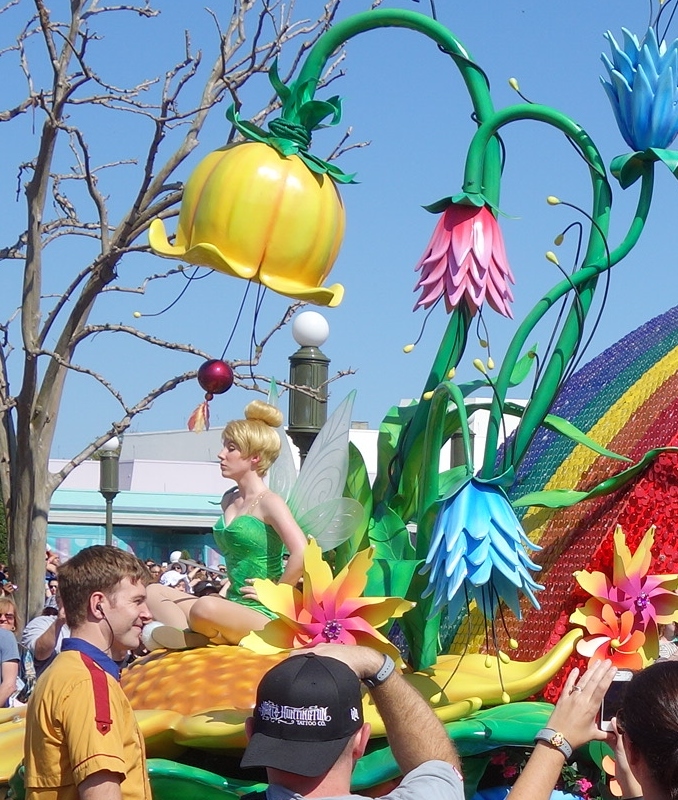 …and some evidence via Tinkerbelle at the rear of the Peter Pan float that this parade is fun for dads, too. A float themed around Brave is next, presenting Merida. 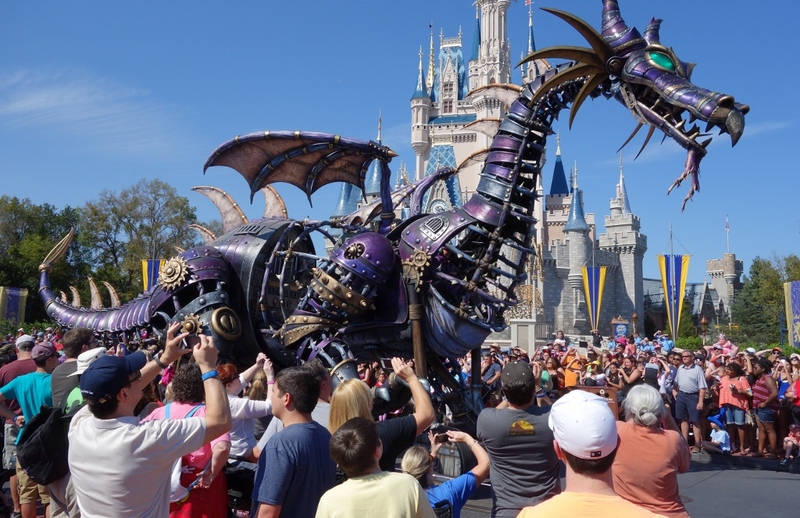 Following it, the tone shifts for exactly one float to Disney villains, with Maleficent in her dragon form. I love this float, but its presence makes no sense in the order of ideas depicted so far. The tone shifts immediately back, with another multi-scened float, this one circus-themed. The lead scene is Pinocchio. …and Pluto bringing up the rear. 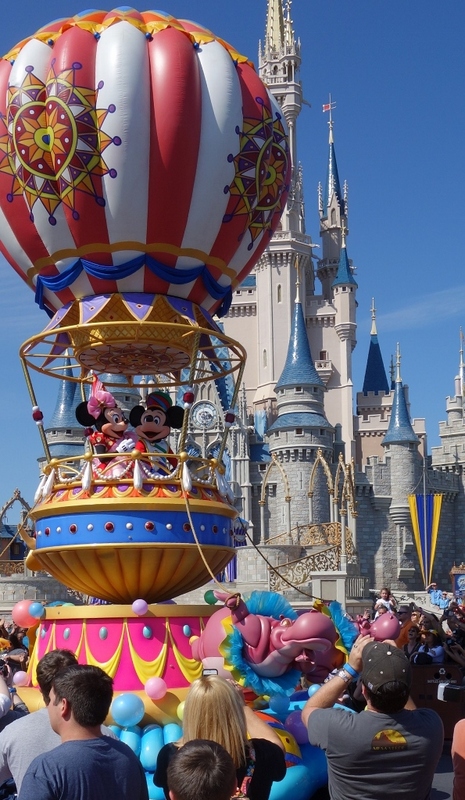 The parade ends with Mickey and Minnie in a very cool hot air balloon float! Dave, this parade looks awesome. I so wish we could have seen it. We flew home the day it started. We had an amazing time there. Kids enjoyed thoroughly. I’m glad I found your site. I used the info I found on it wherever we went. Is the parade worth a fp? 2 days in Mk for us. Joe, there’s plenty of great viewing spots for the parade, so I don’t think it worth a FastPass+. So not worth a FP+? How long in advance does one need to stake out a spot in order to get a great view if not FP+’ing it? And how early/late can you arrive if you have a FP+? 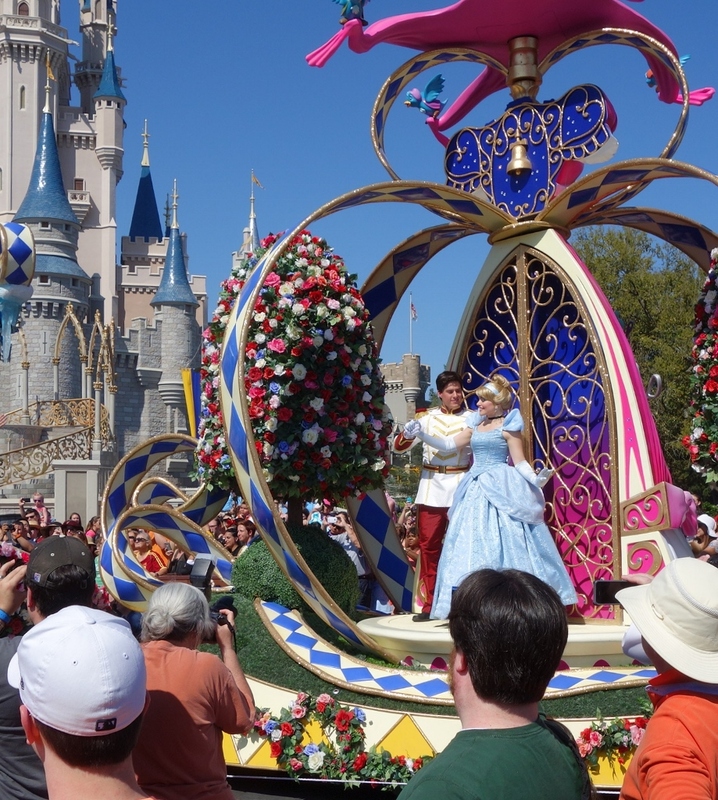 I ask because when we went a few months ago we only saw one parade (MCMCP) and the worst part was containing/entertaining the children while we waited. 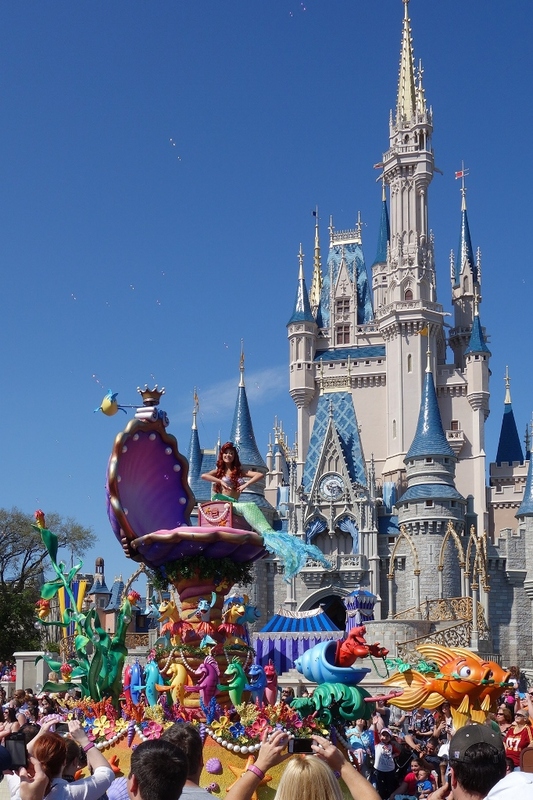 This parade is a must for us on the next trip and I’ve been wondering if FP+ is worth it or not in our case…Thanks for your thoughts! KE, because the floats are so tall you can get great views from all kinds of spots. To see the dancers at ground level, FP+ is OK, or pick a spot 30 minutes befroe in Frontierland. Do you know if this parade is long standing as in will it still be running in September? Also are you aware if Malifecient will also be in the parade or just the dragon? Lisa, yes this will now go on for years. And as long as Maleficent is in her dragon form as a float, that’s the only way I expect her to show up! Any specific spots in Frontierland that you think are best for viewing? We will have a 7 and 4 year old with us and probably won’t be able to wait more than 30 min for it to start. Will be there 5/5/14 which is ranked 5th on your weeks to go. Thanks for any help! This parade is surely AMAZING! I’ve only seen it on Youtube but I can’t wait to see it for real this summer! xD By any chance do you happen to know if the soundtrack will be released soon? I’d like to see this in Frontierland, on the south side (by Pecos Bill’s). However, we plan to be near Splash/Big Thunder before the parade starts. How soon do they start roping off the area? Can we get across “the street” at 2:45? 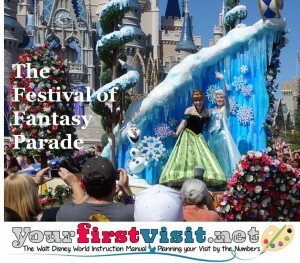 I was hoping you could give me some good tips/advice for Festival of Fantasy parade. My family & I have fast passes for the Seven Dwarf ride at 2:25-3:25 on the day we are at Magic Kingdom. (We’re just doing a short Disney trip this year so we only have 1 day at Magic Kingdom). At the time I made the fast pass reservations, I had forgotten about this parade. I plan on being in line for seven dwarf right at 2:25 then hopefully catching the parade. Do you think it would be best to head towards the main entrance to watch it or head towards frontierland? I tried to change the times of my fast pass but there are no other times available. We will be at magic kingdom the night before for the holloween party so another option would be to try to ride the ride during that time if the line isn’t crazy, then skipping the fast pass for the day we have it & line up for the parade early. What is your opinion on this? Amy, 7 Dwarfs is still seeing lines on party nights til late, so I would stick with your FP+–although you should check its lines after the second parade at your party! You can (usually) enter 5 minutes before your official FP+ window, so try at 2.20p. The ride itself is very short, so you should be able to get to Frontierland. Take the path to the right of the castle and right of the hub (when facing Main Street). Thank you so much! That’s what we’ll do! I was able to get an ADR for BOG lunch on both days that we will be at MK for spring break!!! We also have a FP for Anna and Elsa (starting at 3:20) on our second day there. On one of the days in the park, I want to see the afternoon parade. We have a friend with us who has never been to Disney. The parade is really fantastic and I highly recommend everyone see it at least once! Especially for the kiddos. We saw it when it debuted last year. Purely by accident. We had finished lunch at BOG and ended up right in front of the castle. The sun was hot, but great viewing. So my concern this year is the timing…we have the lunch at BOG very late (I had forgotten about the parade) at 2:15 and on another day at 2:20. Things were pretty wild getting the ADR on Feb. 25th, so I blindly just grabbed what I could and was happy. If we try to catch the parade on our first day at MK, after the 2:15 ADR, what is the quickest route to a good viewing spot?? We just sort of happened upon it all last year. Keeping in mind we will be coming out of BOG. I’ll try and look at a map too. How likely is it they will do a second parade during sping break? One last question: how is all that hub construction hampering movement around the castle? Ann, the timing may well be tight. Head back towards the Castle, but go right between its a small world and Peter Pan, and continue past Haunted Mansion, to find a spot in Liberty Square. The hub construction is having little impact on movement–and some is done!! Hi Dave, we are going to Disney in October and we’re planning. We want to have FP+ that will be done by 12:30. 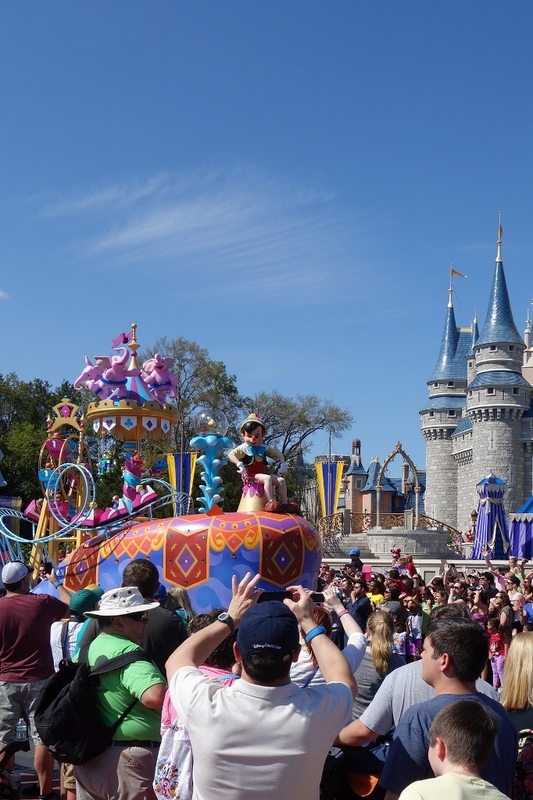 Is it worth it to try to get a daytime parade FP+, then later the nighttime parade FP+ after? Or should we spread our FP+. 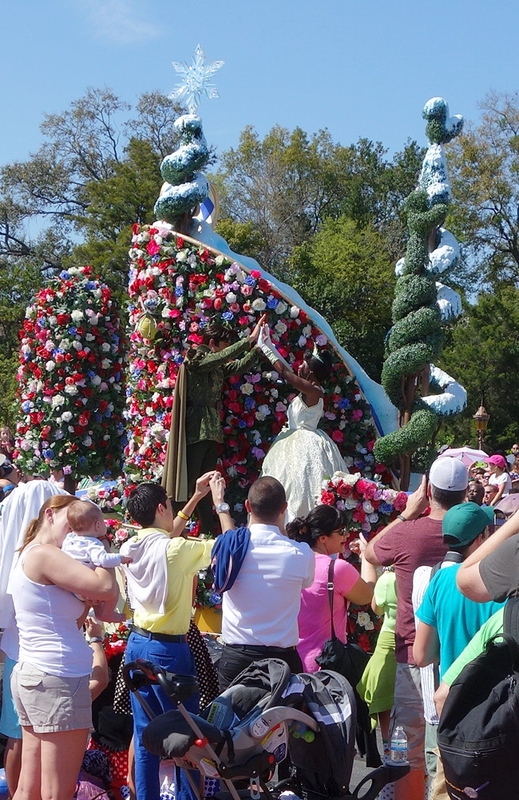 If we don’t, should we book more attractions after instead of parades? Will the crowds be a problem and affect any of this? I’m just really confused and have a hundred things in my hand. Thanks! 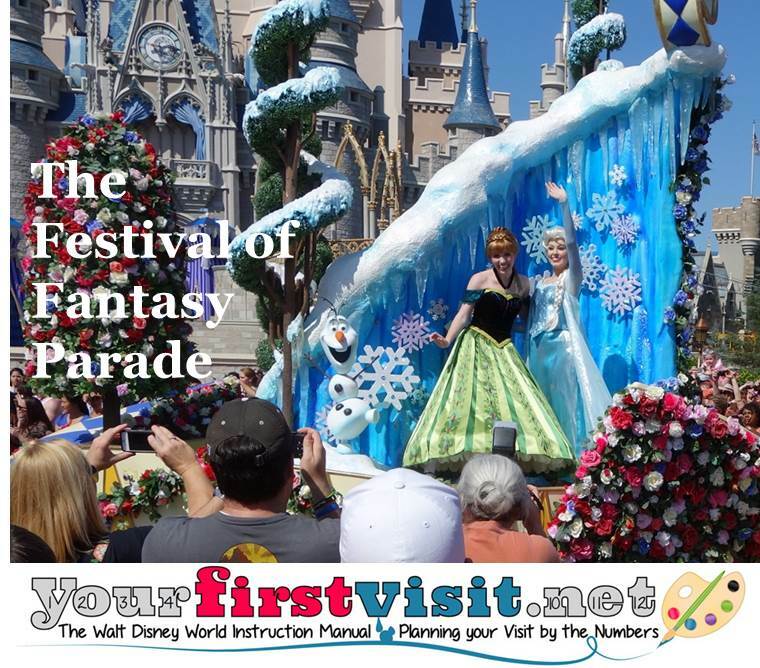 Debbie, FP+ for the parades will almost certainly be booked weeks before, so you will not be able to add them that day. For more on FastPass+, see this, and we also have extensive guidance and priority lists in Chapter 6 of our book, and technical guidance on how to book it in Chapter 9. Forgot to mention late October and its a party of 5. My husband, my 3 sons (15,13,13) and me. Thanks! Hi Dave, how early do you recommend getting into place for the parade during a high crowd time of year? We have little kids but I think they are tall enough to see these extra tall floats even if others are in front of them, so I’m not that worried about it. But we didn’t at all try to see a parade with them last time, so I am new at this. Thanks! We are staying at a Disney resort but we only have 1.5 days at MK. Our vacation is 6.5 days long, and we’ll be getting the 4 day park hoppers that come with the military salute (that is, assuming it is renewed again). We don’t want to do more park days b/c the extra cost for more tickets is pretty high, and there is so much other stuff at WDW to do. Thank you for recommending the FP, I didn’t know that was available. Not sure if we want to use FP for that but will think about it. It’s our 2nd visit so we’re mostly going to use FP for things we missed the first time around, and the parade is one of those things. Hi! We’re going to MK this weekend and I keep changing our Fast passes in fear we won’t have time to get to certain spots. This is our first time going and only going 1 day. Is it best to start in fantasy land and work our way back around to front? How long is the 3:00 parade? We have to see a few characters in fantasy land, have to eat lunch, Bibbidi bobbidi boutique appt , then parade at 3:00!! How does fast pass actually work? For example 9:00-10:00 – do I plan for an hour of standing or can I go to it anytime in that block?? Jackie, on your last question you can enter the FastPass+ return line anytime in that window. A one day visit is very hard as it takes two days to see everything. How old are your kids?? Only bringing our oldest who is 5 years old. OK Jackie, arrive well before open then indeed head to Fantasyland. See right away the rides there that build lines for which you don’t have FastPass+–Peter Pan and Seven Dwarfs are the prime targets. Nic, for WDW see this and for Universal see this.